Genes Load the Gun. Lifestyle Pulls the Trigger. From the way our neurons communicate with one another to the birth and growth of new brain cells, our personal day-to-day choices are continually influencing what’s going on inside our brains. We will now see how these effects are controlled not only by our lifestyle choices but also by the interplay of our behavior and genetic predisposition. Let’s begin by addressing the delicate and highly complex theme of our genetic individuality. As Dr. James D. Watson said back in the 1960s, “We’re not all equal, it’s simply not true. That isn’t science.” As the quote points out, it takes none other than the man who discovered DNA’s double helical structure to confirm just how complex, variable, and highly individual our genes are. This inherent individuality occurs in a substantial portion of our genome, giving rise to distinctive characteristics such as hair and eye color. These variations depend on the subtler genetic information carried in our DNA. Whenever you are looking into a loved one’s eyes, you are experiencing nothing less than a distinctive display of their signature genetics at work. How this actually occurs is less obvious. Our genetic variability is the result of thousands of years of continuous genetic mutations. A mutation is a permanent change in our DNA. For example, originally, all humans had brown eyes. But some six thousand to ten thousand years ago, a genetic mutation occurred that produced the first blue-eyed human. When this first happened, one can only imagine the sensation it caused! Since then, the blue-eye gene has spread the world over and today is considered a fairly common trait. Genetic mutations have happened throughout the course of evolution. Some are positive, such as the mutations that ultimately led to the beauty of different eye colors or to the increased size and power of our brains. Other mutations are harmful and lead to disease. However, these “bad” genetic mutations are rare, affecting less than 1 percent of the population. To sum it up, there are a handful of genetic mutations that can make us sick, and a myriad of genetic variants that simply make us different. This is particularly true as far as our brains are concerned. The human genome sports an estimated 15 million variations, a large part of which involve brain function. Just imagine that each and every one of us carries at least some permutations of all these variations, and the term “diversity” assumes a whole new meaning. Our brains possess something akin to a fingerprint. While the architecture of the brain, with its various partitions into functional areas and specific structures, might be roughly the same in all of us, there are large variations when it comes to brain size, shape, activity, and molecular composition. Such differences are not only based on our unique genetic makeup, but are shaped, molded, and written upon by our back- grounds, education, and experiences. Add to that the many foods we’ve been exposed to, our cultural environments, and all the places we’ve explored since the day we were born, and it only makes sense that no two brains could ever be alike. This tremendous variability is never more evident than when viewing brain scans. I have been doing brain imaging for over fifteen years, inspecting and quantifying hundreds, if not thousands, of scans. Among them are those of the young and old and every age in between, those of men and women, those of the happy and the unhappy, of the healthy and less fortunate. In addition, I’ve studied equal numbers of scans showing the effects of neurological diseases like Alzheimer’s, Parkinson’s, or stroke. Not a single day goes by that I do not stand in awe at the uniqueness that each patient’s scan reveals, each one different and distinct from the next. In the end, it is our unique genetic makeup, combined with our own lifestyle and behavior, that determines the fate of our brains, and therefore our chances of aging gracefully over the course of a lifetime—or of forgetting names and faces instead. While it is true that one’s brain blueprint largely depends on the DNA it has received from its parents, recent discoveries have led to re- thinking the old view that “you are your DNA” in favor of a much more dynamic model. In this new model, genes are pivotal in establishing some aspects of brain health, but it is our current, ongoing lifestyle choices that play a central role in turning those genes on or off. As strange as this might sound, you actually have the power to activate or silence your genes, and this discovery is called epigenetics. Epigenetics refers to the fact that while your lifestyle choices won’t modify the structure of your DNA, they do have the ability to modify the way your DNA works. Where you live, who you interact with, how you exercise, which medications you take, and—yes, you guessed it— especially what you eat cause changes inside your body that in turn switch your genes on or off. This can occur once in a lifetime or continuously over time, thereby influencing your chances of retaining or not retaining optimal cognitive fitness. What all this boils down to is that your DNA is not your destiny after all. The genetic lottery might determine the cards in your deck, but the way you are living your life deals you the hand you are actually playing. We’re back to where we started—genes load the gun, but lifestyle pulls the trigger. 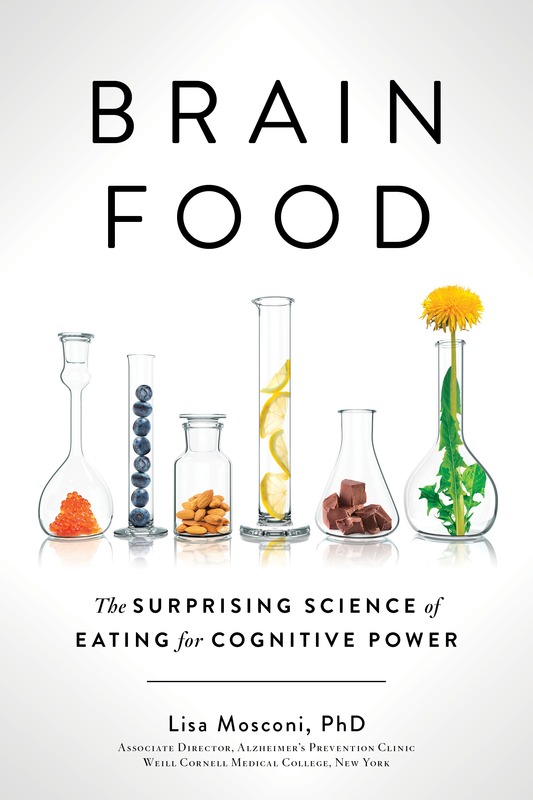 Credit line: Reprinted from Brain Food: The Surprising Science of Eating for Cognitive Power by arrangement with Avery, an imprint of Penguin Publishing Group, a division of Penguin Random House LLC. Copyright © 2018, Lisa Mosconi. Dr. Lisa Mosconi, PhD, INHC, is the associate director of the Alzheimer’s Prevention Clinic at Weill Cornell Medical College (WCMC)/NewYork-Presbyterian Hospital, were she was recruited as an associate professor of Neuroscience in Neurology. She also is an adjunct faculty member in the Department of Psychiatry at NYU School of Medicine, and in the Department of Nutrition at NYU Steinhardt School of Nutrition and Public Health. Formerly, Dr. Mosconi founded and was the director of the Nutrition & Brain Fitness Lab at New York University School of Medicine (NYU), and an assistant professor in the NYU Department of Psychiatry, where she served as the director of the Family History of Alzheimer’s disease research program. Dr. Mosconi holds a PhD degree in Neuroscience and Nuclear Medicine from the University of Florence, Italy, and is a board certified integrative nutritionist and holistic healthcare practitioner. She is well known for her research on the early detection of Alzheimer’s disease and is passionately interested in the mitigation and prevention of memory loss through lifestyle modifications including diet, nutrition, and physical and intellectual fitness.